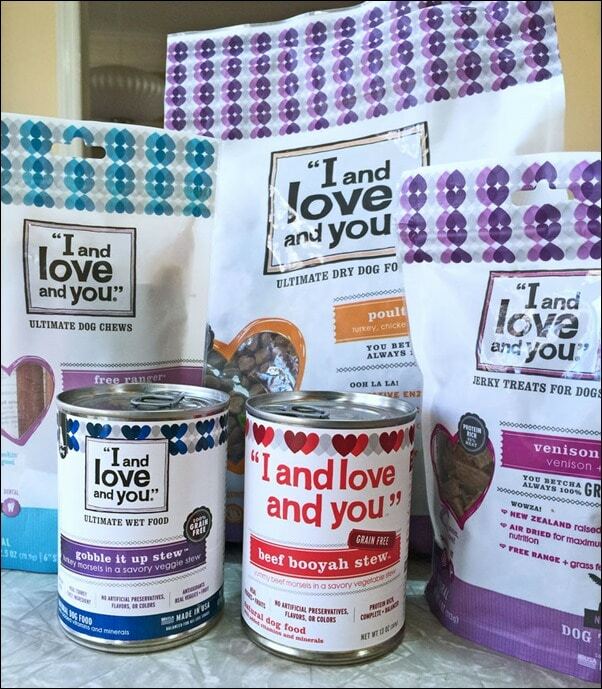 Nellie gives "I and love and you" dog food products two paws up! Many of us had healthy eating goals this year for ourselves and our families. But did you consider the furry members of your household, like your dog? Our dog Nellie eats a premium brand of dog food, but I’m always on the lookout for other quality brands to sample. That’s why I was interested in trying out “I and love and you” brand of dog foods and treats. Nellie LOVED the “I and love and you” canned dog food to the point of ridiculousness. She literally jumped up and down as I got the can, opened it, and put it in the bowl. We’ve given her canned food before (another brand) when she had dental surgery, and expected a positive reaction. But this was over the top. I’d never seen her put both paws on the counter top and watch us put the food in the bowl. And then she would gobble the food down in under 10 seconds. I’ve never seen her eat so fast! I believe the beef canned food was a little more of a favorite with her, but Nellie loved them both. My only complaint is that half a can isn’t quite enough and a whole can is too much for one feeding. If I was to serve this on a regular basis, I’d mix it with her dry dog food. Speaking of dry food food, she also loved “I and love and you”’s Poultry Palooza food. I like how the kibble is smaller than her regular brand, which is easier on her teeth. (It’s also heart shaped, which is really cute.) Nellie is missing a couple of teeth and has enamel damage to her remaining canines according to her vet. She does prefer to have soft food, so we end up adding water to her kibble to make it softer. After reading about pets being poisoned by treats manufactured overseas, it’s important to me that they’re made here in the USA from quality ingredients. The Nice Jerky: Venison Treats are perfect for rewarding your dog during behavior training or when they do their favorite tricks, since they’re small pieces. We like to toss them in the air for Nellie to catch in her mouth! They contain 95% grass fed, free range venison. Unlike a lot of other bull pizzle treats (yep, that’s what you think it is), Free Ranger Bully Stix don’t stink. Seriously other brands are horrid and I detected no smell from the “I and love and you” version. If I only buy one item from “I and love and you” it will be these – by the case! The cattle are naturally raised with no hormones or antibiotics. Nellie loves to carry her Bully Stix around in her mouth like a big doggie cigar. Then she sits at my feet under my desk and proceeds to eat them up. Actually, I was surprised how much she liked them. Nellie isn’t a chew treat kind of dog. However, she immediately took to the Free Ranger Bully Stix. She also likes to hide them around the house. She even hid one in my daughter’s bed! Here’s a video of Nellie hiding and enjoying “I and love and you” Free Ranger Bully Stix. Don’t mind my messy office. Currently you can buy “I and love and you” products online at Petco.com. You can use their store locator to find where their products are sold near you. I can find “I and love and you” products at my local Kroger, so now I know where to get someone the occasional canned food treat during the holidays! “I love and you” also carries other products like raw foods, biscuits, remedies, flea and tick treatments, and a line of cat products, too. You can learn more at “I and love and you”’s website and YouTube channel. Connect with them on Twitter and Facebook, too. Posted in Dogs, Products and Equipment on January 30, 2015 by Anne-Marie Nichols. 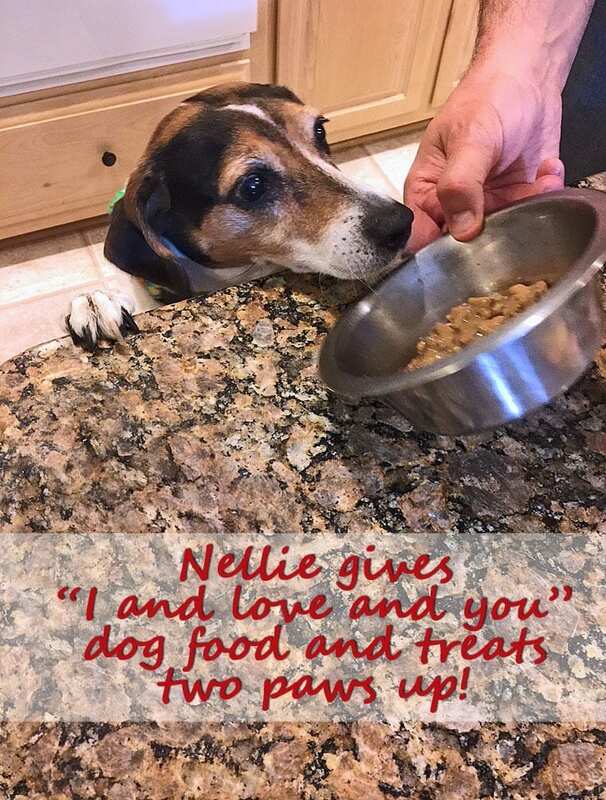 I love hearing Nellie’s feedback on I and Love and You dog food (which is local to me). Lola has successfully lost 10 pounds and might be up for trying a new dog food to celebrate! Love the integrity of their products.